To maximize the lifespan of your diamond core drill bit and minimize drilling material damage, it is important to run your diamondcore drill bits at the proper drill speed and pressure. Drilling speeds vary with diameter of diamond core drill bit, diamond grit size, water being used, diamond bond type and hardness, as well as material hardness. 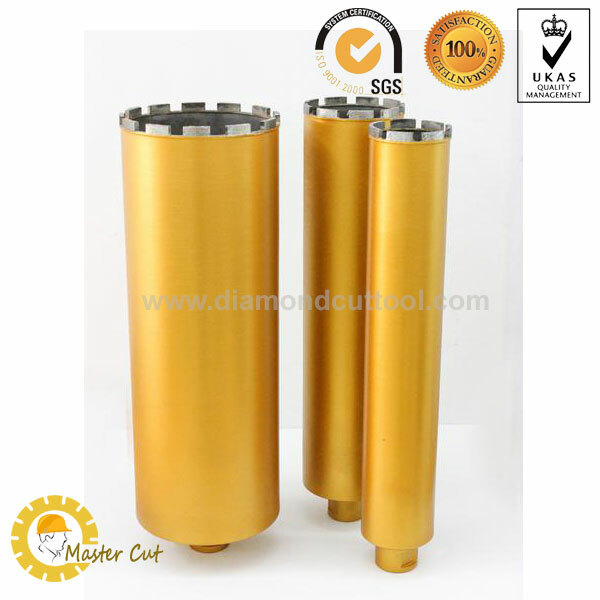 Diamond core drill bits from .001” required drilling speeds as high as 150,000+ RPM. Whereas very large diamond drill bits 48” diameter require drilling speeds as low as 3 RPM’s. Here is a chart of Recommended RPM's (speeds) in correlation to diamond core drill bit diameter. Please note this chart is for reference purpose only to be used as starting point only. RPM's will vary with material being drilled, material hardness, density, geometry, drilling depth, environment, and operator objectives. Soft and abrasive materials your drilling can be higher drilling speeds, while hard and dense materials require much slower speeds. Faster drilling might appear to increase your working efficiency, but it is an increase in friction and heat, which considerably reduces the core bit life and increases the risk of heat fractures and breakage in the material being drilled. Meaning if a diamond core drill bit develops dark “burn” marks at the diamond core bit segment, the diamond core drill bit is being used is too fast or the amount of pressure is too great. Reduce drilling speed or adjust pressure accordingly. It is generally recommended that you use a diamond drill bit as fast as it will drill freely.